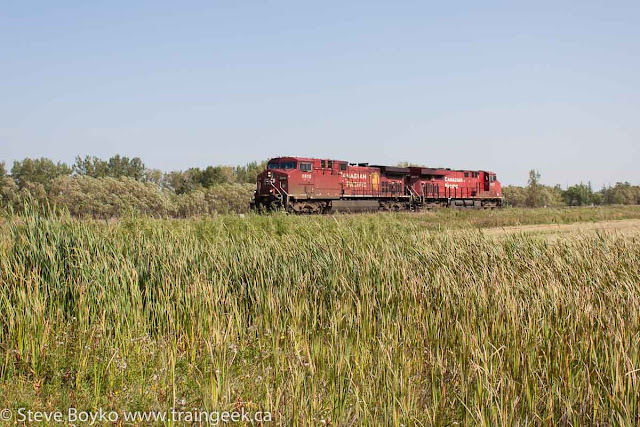 In early September I found myself out at Diamond, looking for a little train action. When I arrived there at 11:15 AM I found a CP train waiting to go south on the CP Glenboro subdivision. 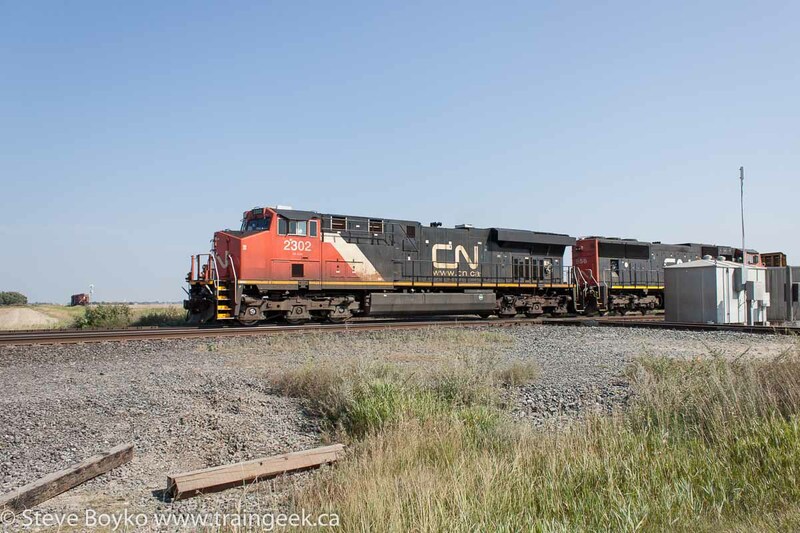 Half an hour later, a westbound CN train rolled into view, led by CN 2302 and CN 5656. The CN train rattled and banged across the diamond. 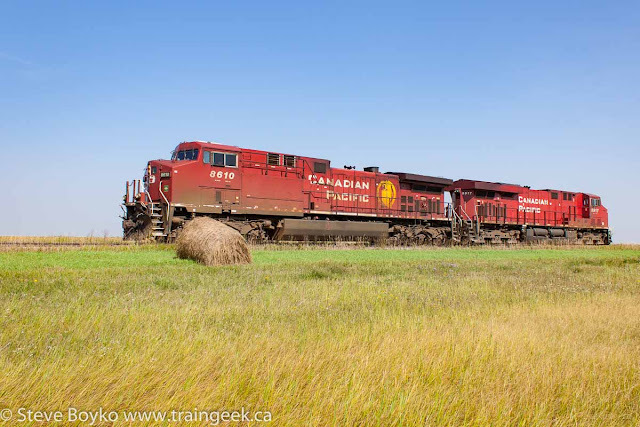 I tried my timing to capture the CP train between two freight cars. After numerous photos I did manage to get it. You can see that the CP crew had opened the front door by this point, maybe to let a bit of air in. 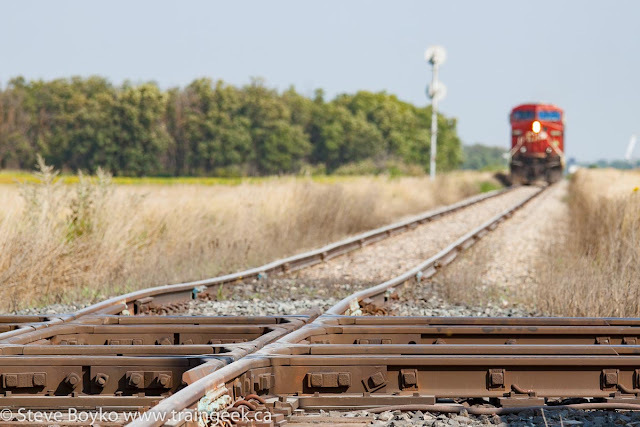 After the CN train passed, the CP crew got the light to cross the diamond and they did so just after noon. I decided to continue west on 427 then head south on 424 to meet up with highway 2. The track crosses 424 near the community of Springstein. At one time there was a CP siding in Springstein, together with a post office, school and church. It still has a church but otherwise it is a collection of houses. 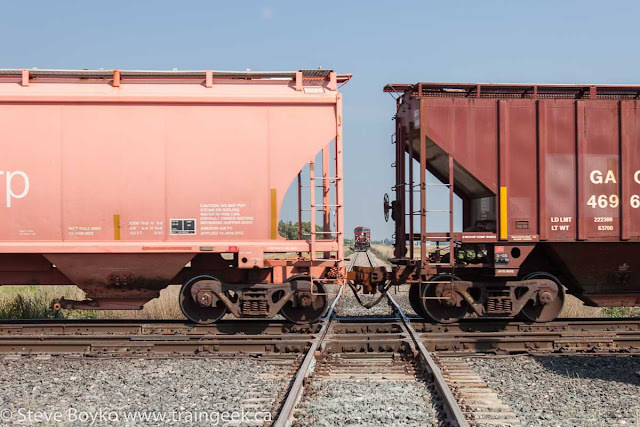 I was able to get there ahead of the pair of "toasters" to capture them approaching the highway crossing. 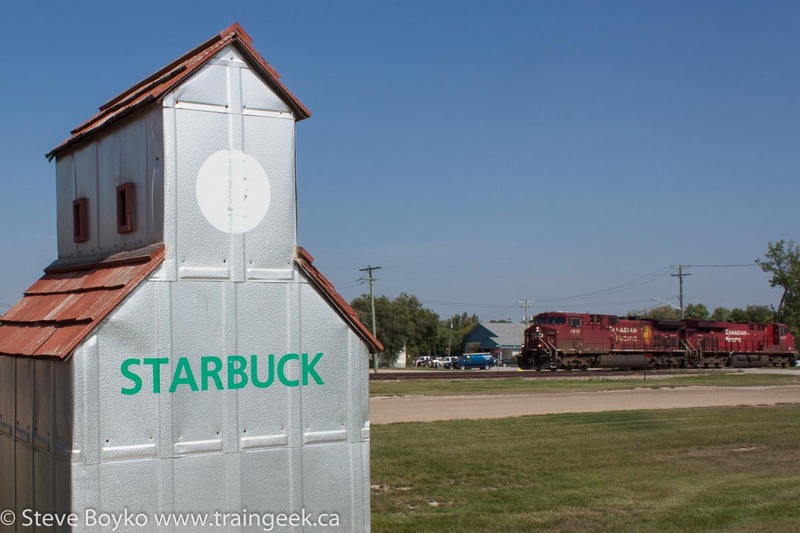 After that, it was a simple matter of getting on highway 2 west toward Starbuck. I arrived well before them and had a quick look around. 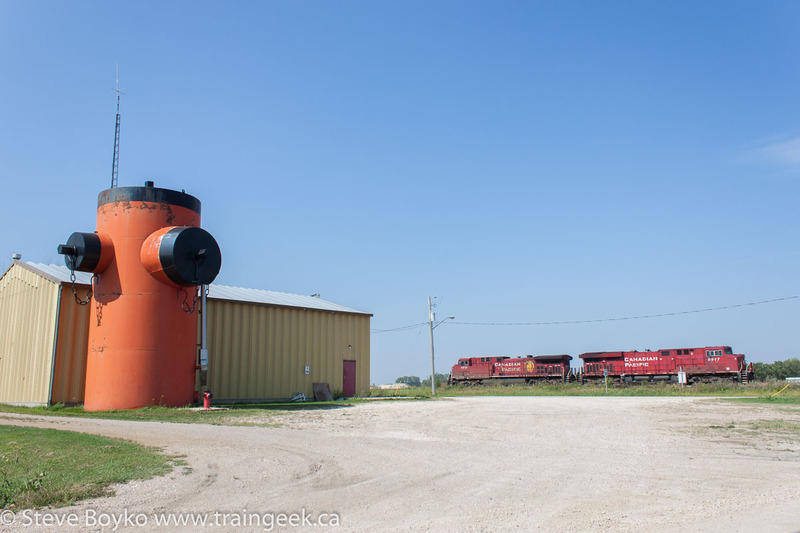 There were no cars at the Pioneer grain elevator so I knew they weren't going to stop there. 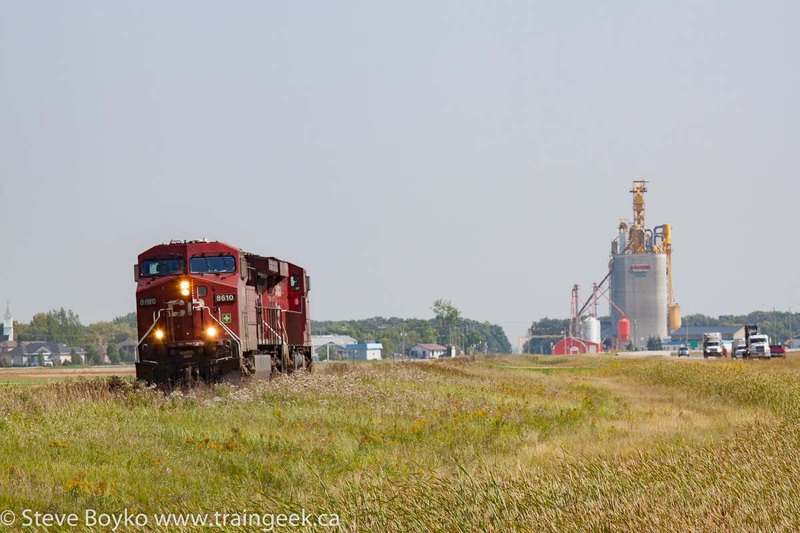 I decided to try to incorporate the two model grain elevators into the shot so I walked around a bit to get the right angle. Soon the locomotives rolled into town. 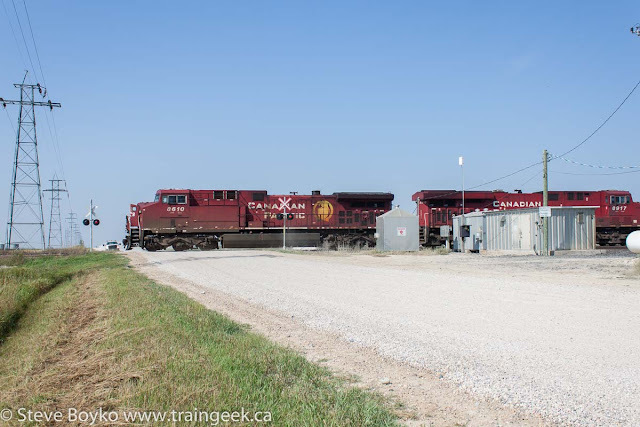 As it happened, they stopped at the highway 332 crossing for the conductor to flag them through, so I had time to grab a quick shot of the locomotives and the elevator before getting back to my planned shot. Here's the shot I had planned. 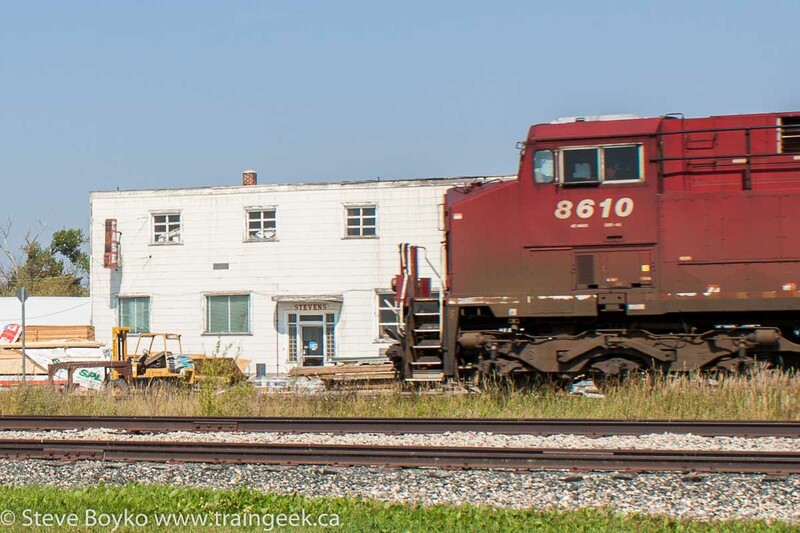 I couldn't resist trying to grab the locomotives on the curve out of town, with the elevator behind them. In retrospect I should have gone just a bit farther so the elevator and the engines were closer together. The next spot was Fannystelle. Again I arrived well before they did, so I had a few minutes to decide what to incorporate into the shot. I decided to try to include the Stevens Lumber building. Here's my attempt. I'm sure the crew were sick of seeing me by this time! 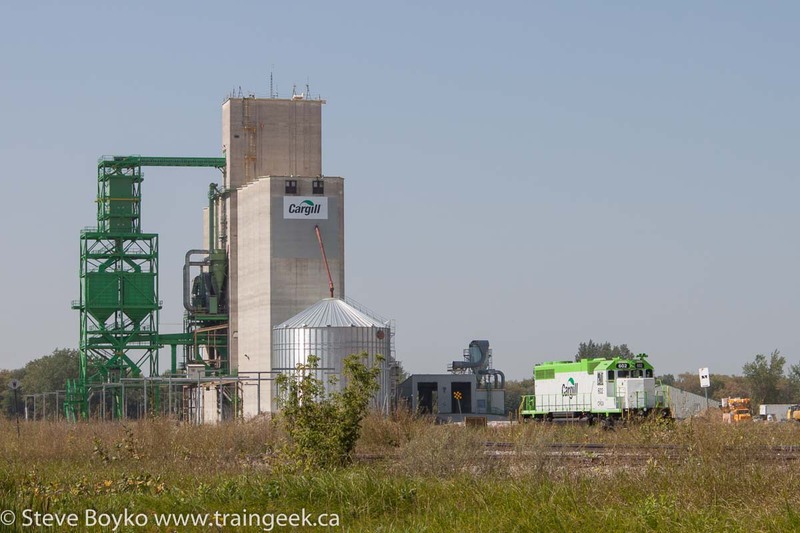 Here they are passing the Viterra elevator in Fannystelle. Notice that there are railway cars spotted near the elevator. I believe there were 4 or 5 BNSF grain cars there, but the CP locomotives carried on without stopping. I decided to grab them between Fannystelle and Culross, and I framed up the handy hay bale to include in the shot. That might be my favourite. 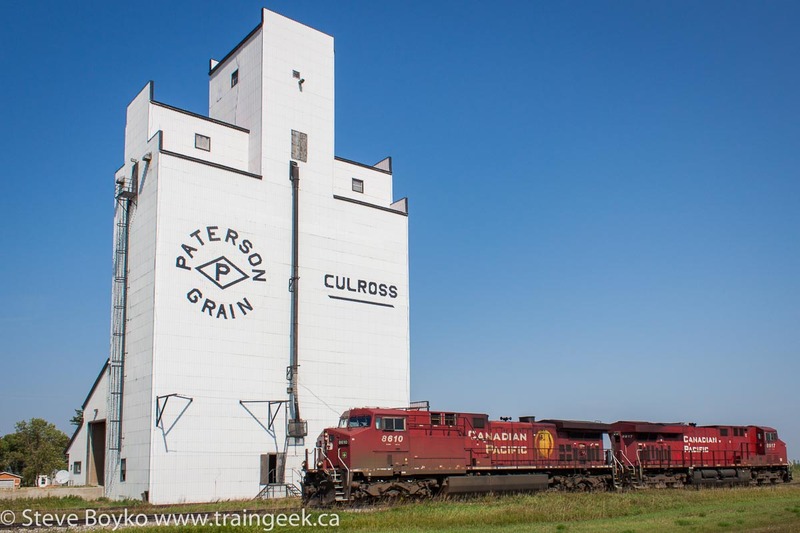 I wanted to get the locomotives with that nice white Paterson elevator in Culross. My 18-55mm lens was not quite wide enough but I did manage to fit the whole elevator in. Barely. The problem here is that the highway was right at my back so I couldn't go back farther without standing in the road, and that's not terribly safe! Elm Creek was next. 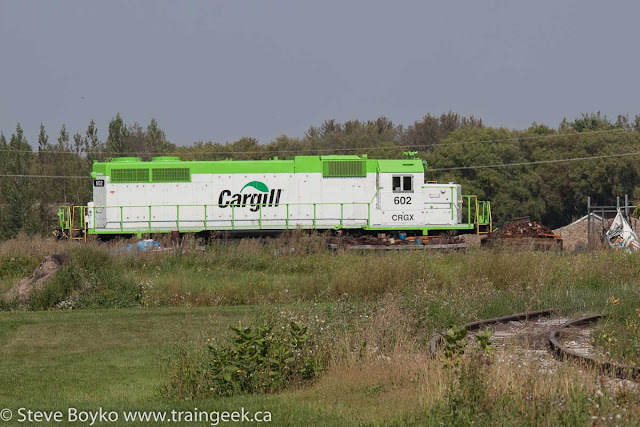 Surely they were stopping at the Cargill elevator there! Nope... they rolled right past the giant fire hydrant in Elm Creek and through the town. I guess they were going all the way to Rathwell. I gave up the chase at this point (13:05) and photographed the new-to-me Cargill switcher in Elm Creek. That green structure to the left of the elevator proper was added recently, and I believe a track or two were also added. CRGX 602 is an SD38, originally a Penn Central unit. It's new to Elm Creek, presumably acquired after the expansion of the Cargill facility there. That was the end of my chase. Here's the map showing where I chased. For most of the trip, highway 2 runs very close to the Glenboro subdivision. Neat to see that line during the warm months! Great photos by the diamond interchange! Thanks, Jason! Diamond is the place to be! I was in Glenboro on Sunday. I noticed at the crossing west of Glenboro, the crossing lights aren't there anymore. Are they going to rip out the tracks next year? Good question, Anonymous. Since it's out of service between Nesbitt and Rathwell there's no need to retain the tracks. Cargil's engine sure has an interesting paint scheme, and it's nice and clean too. I've got to get out to MB. Great stuff as always!